A lot of buzz talks over Internet which suggests that machine learning and Artificial Intelligence (AI) are basically the same thing, but this is a misunderstanding. Both machine learning and Knowledge Reasoning have the same concern: the construction of intelligent software. However, while machine learning is an approach to AI based on algorithms whose performance improve as they are exposed to more data over time, Knowledge Reasoning is a sibling approach based on symbolic logic. Knowledge Reasoning’s strategy is usually developed by using functional and logic based programming languages such as Lisp*, Prolog*, and ML* due to their ability to perform symbolic manipulation. This kind of manipulation is often associated with expert systems, where high level rules are often provided by humans and used to simulate knowledge, avoiding low-level language details. This focus is called Mind Centered. Commonly, some kind of (backward or forward) logical inference is needed. Machine learning, on its turn, is associated with low-level mathematical representations of systems and a set of training data that lead the system toward performance improvement. Once there is no high-level modeling, the process is called Brain Centered. Any language that facilitates writing vector algebra and numeric calculus over an imperative paradigm works just fine. For instance, there are several machine learning systems written in Python* simply because the mathematical support is available as libraries for such programming language. This article aims to explore what happens when Intel solutions support functional and logic programming languages that are regularly used for AI. Despite machine learning systems success over the last two decades, the place for traditional AI has neither disappeared nor diminished, especially in systems where it is necessary to explain why a computer program behaves the way it does. Hence, it is not feasible to believe that next generations of learning systems will be developed without high-level descriptions, and thus it is expected that some problems will demand symbolical solutions. Prolog and similar programming languages are valuable tools for solving such problems. As it will be detailed below, this article proposes a Prolog interpreter recompilation using Intel® C++ Compiler and libraries in order to evaluate their contribution to logic based AI. The two main products used are Intel® Parallel Studio XE Cluster Edition and SWI-Prolog interpreter. An experiment with a classical AI problem is also presented. Count|Thread Count)') . Different operating systems may require minor changes. Optimizing performance on hardware is an iterative process. 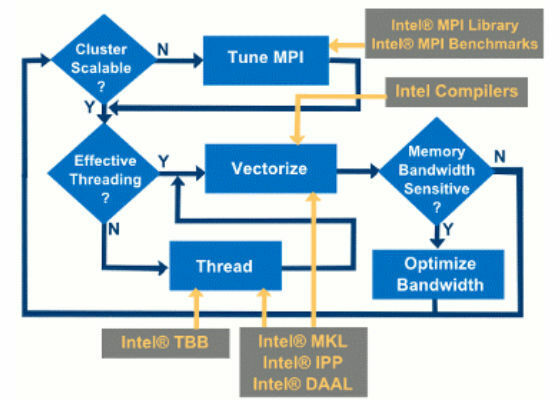 Figure 1 shows a flow chart describing how the various Intel tools help you in several stages of such optimization task. Figure 1: Optimizing performance flowchart and libraries. Extracted from Intel® Parallel Studio documentation1. Although you may prefer to perform a full install, this article will choose a custom installation with components that are frequently useful for many developers. It is recommended that these components also be installed to allow further use of such performance libraries in subsequent projects. Then, it is necessary to set some compilation variables. The CC variable must be changed to indicate that Intel® C++ Compiler will be used instead of other compilers. The COFLAGS enables optimizations for speed. The compiler vectorization is enabled at –O2. You may choose higher levels (–O3), but the suggested flag is the generally recommended optimization level. With this option, the compiler performs some basic loop optimizations, inlining of intrinsic, intra-file interprocedural optimization, and most common compiler optimization technologies. The –mkl=parallel option allows access to a set of math functions that are optimized and threaded to explore all the features of the latest Intel® Core™ processors. It must be used with a certain Intel® MKL threading layer, depending on the threading option provided. In this article, the Intel® TBB is such an option and it is used by choosing –tbb flag. At last, the CMFLAGS indicates the compilation will create a 64-bit executable. Save your build file and close it. Note that when this article was written, SWI-Prolog was not Message Passing Interface (MPI) ready3. Besides, when checking its source-code, no OpenMP* macros were found (OMP) and thus it is possible that SWI-Prolog is not OpenMP ready too. Save your messages.pl file and close it. Start building. Welcome to SWI-Prolog (threaded, 64 bits, version 7.4.2) @ Intel® architecture SWI-Prolog comes with ABSOLUTELY NO WARRANTY. For exiting the interpreter, type halt. . Now you a ready to use Prolog, powered by Intel® architecture. Until now, there is an Intel compiled version of SWI-Prolog in your computer. Since this experiment intends to compare such combination with another environment, a SWI-Prolog interpreter using a different compiler, such as gcc 5.4.0, is needed. The procedure for building an alternative version is quite similar to the one described in this article. This test intends to compare the performance of Intel SWI-Prolog version against gcc compiled version. Note that terminal output printing is a slow operation, so it is not recommended to use it in benchmarking tests since it masquerades results. Therefore, the program was changed in order to provide a better probe with a dummy sum of two integers. S is 1 + 2. Recall that the SWI-Prolog source-code did not seem to be OpenMP ready. However, most loops can be threaded by inserting the macro #pragma omp parallel for right before the loop. Thus, time-consuming loops from SWI-Prolog proof procedure were located and the OpenMP macro was attached to such loops. The source-code was compiled with –openmp option, a third compilation of Prolog interpreter was built, and 8 threads were used. If the reader wishes to build this parallelized version of Prolog, the following must be done. At ~/swipl-/src/pl-main.c add #include <omp.h> to the header section of pl-main.c; if you chose, you can add omp_set_num_threads(8) inside main method to specify 8 OpenMP threads. Recall that this experiment environment provides 4 cores and hyper threading turned on with 2 threads per core, thus 8 threads are used, otherwise leave it out and OpenMP will automatically allocate the maximum number of threads it can. At ~/swipl-<version>/src/pl-prof.c add #include <omp.h> to the header section of pl-prof.c; add #pragma omp parallel for right before the for-loop from methods activateProfiler, add_parent_ref, profResumeParent, freeProfileNode, freeProfileData(void). The test employs a 20 disk instance problem, which is accomplished after 3,145,724 inferences. The time was measured using Prolog function called time. Each test ran 300 times in a loop and any result that is much higher than others was discarded. Figure 2 presents the CPU time consumed by all three configurations. Figure 2: CPU time consumed by SWI-Prolog compiled with gcc, Intel tools, Intel tools+OpenMP. 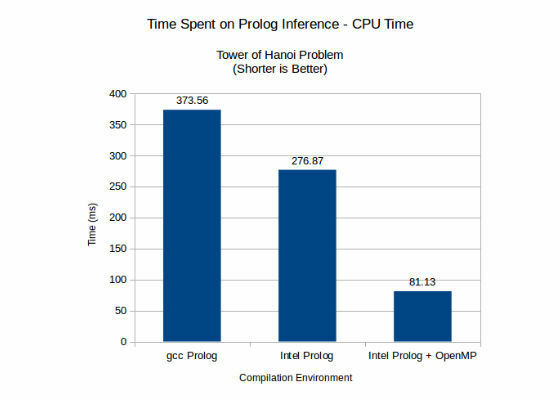 Considering the gcc compiled Prolog as baseline, the speedup obtained by Intel tools was 1.35. This is a good result since the source-code was not changed at all, parallelism was not explored by the developer and specialized methods were not called, that is, all blind duty was delegated to Intel® C++ Compiler and libraries. When Intel implementation of OpenMP 4.0 was used, the same speedup increased to 4.60x. This article deliberately paid attention to logic based AI. 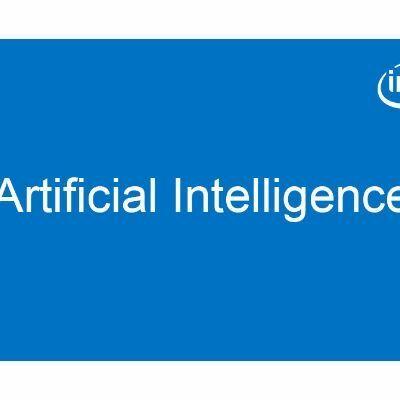 It shows that benefits with using Intel development tools for AI problems are not restricted to machine learning. A common distribution of Prolog was compiled with Intel® C++ Compiler, Intel® MKL and Intel implementation of OpenMP 4.0. A significant acceleration was obtained, even though the algorithm of Prolog inference mechanism is not easily optimized. Therefore, any solution for a symbolic logic problem, implemented in such Prolog interpreter, will be powered by an enhanced engine.